Norwegian Cruise Line is launching its Caribbean Bonus Days, offering exceptional savings on select Bahamas and Caribbean sailings beginning this Fall through Winter 2015. Guests who book a Norwegian cruise vacation from Monday, May 26 through Saturday, May 31, 2014, can receive up to $100 per stateroom to spend on board. Air credits up to $1,000, Military, AARP and Latitudes Rewards discounts, along with reduced rates for solo travelers, also apply to select sailings. 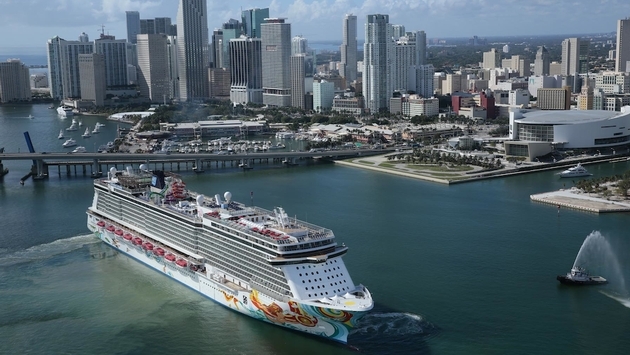 Guests can extend their summer aboard Miami’s ultimate ship, Norwegian Getaway, as she sails seven-day cruises to the Eastern Caribbean from her year-round homeport of Miami, Florida. The line’s newest ship visits tropical ports of call including Philipsburg, St. Maarten; St. Thomas, U.S. Virgin Islands; and Nassau, Bahamas. On board, guests will be dazzled by the ship’s Miami flair, exceptional dining and entertainment as well as the excitement of 678 Ocean Place and The Waterfront, a variety of interconnected indoor and outdoor venues on three dynamic decks that creates a multiplex of dining, activities and more that enhance guests’ connection with the ocean. Fares start at $599. Also sailing from Miami, Norwegian Epic cruises to sunny Western Caribbean destinations on seven-day sailings between November 9 and April 19, 2015. Cruisers will explore ports of call including Ocho Rios, Jamaica; Costa Maya, Mexico; and Cozumel, Mexico; with fares starting at $449. Beginning October 5, 2014 through April 19, 2015, cruisers can set sail from the Big Apple on seven-day Bahamas & FL cruises on board Norwegian Breakaway, Norwegian Getaway’s sister-ship and the ship that brings the best of NYC to Sea. Fares start at $599. Sailing from Houston between October 11 and April 11, 2015, the newly-refurbished Norwegian Jewel cruises to tropical Western Caribbean destinations. Guests on board will visit Cozumel, Mexico; Belize City, Belize; and Banana Coast, Honduras. Fares start at $409. Guests looking to vacation to beautiful Costa Maya, Mexico, can do so from Tampa aboard Norwegian Sun, starting October 26, 2014 through April 12, 2015. Additional ports of call include Roatan, Honduras; Belize City, Belize; and Cozumel, Mexico. Fares start at $419. To book a cruise during Norwegian’s Caribbean Bonus Days sales event, contact a travel professional, call Norwegian at 888-NCL-CRUISE (625-2784), or visit www.ncl.com.